In 2007 an additional £675 million was diverted from National Lottery good causes to pay for infrastructure on the Olympic Park. £425 million of this would otherwise have been distributed by the Big Lottery Fund, mostly to small charities and community groups doing crucial work across the country. Instead, those groups went without vital funding during a period of severe recession and drastic cuts in public spending. At the time there was significant opposition from the voluntary sector and many MPs to the decision. As a result the then Olympics Minister, Tessa Jowell, promised that the money would be paid back after the Olympics from the proceeds of assets sales. She agreed a Memorandum of Understanding with the then Mayor of London, Ken Livingstone, to agree how the funds would be repaid. The Conservative-led coalition government amended and formalised the repayment agreement, which has since been reaffirmed by the successive Conservative governments. However, we have been repeatedly told that the money may not come back in full until the 2030s – which we find totally unacceptable. As shadow Minister for Culture Media and Sport, Theresa May strongly opposed government interference in the Lottery funds, saying before the raid that ‘every pound that the government choose to snaffle in that way is a pound that cannot go to help community groups.’ But despite repeated letters to her and other ministers, the government is still dragging its heels on paying back the Lottery good causes. The LLDC (London Legacy Development Corporation) now owns the assets, but so far, little has been sold off to reimburse the Lottery – and of course, the Olympic stadium has been signed over to West Ham, one of the richest football clubs in the world, paying a mere £2.5 million a year on a 99-year lease. 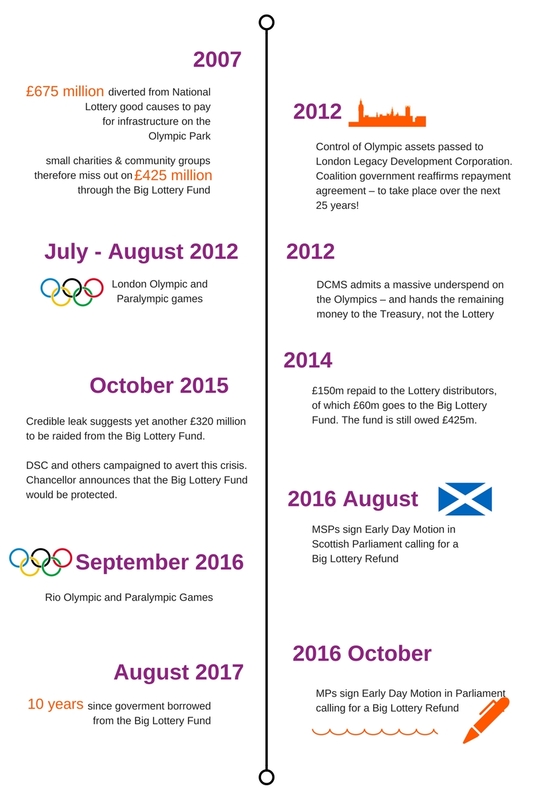 We believe that a solution could be reached that would not negatively impact the government balance sheet by taking on the role of creditor and paying back charities now against the future sale of Olympic assets. Charities and community groups across the UK need this money now, not in twenty years. £425 million would enable up to 42,000 charities to improve the lives of millions of people. What has the campaign achieved so far? We’ve gained the support of almost 4,000 individuals and charities and generated national media coverage. MPs and MSPs have supported our call for a refund through Early Day Motions and Parliamentary Questions, holding the government to account its repayment schedule. In October 2015, a credible leak suggested that the then Chancellor was threatening to raid yet another £320m from the Big Lottery in the autumn Spending Review. DSC and other leading charities campaigned in the final weeks before the review to avert this crisis, culminating in the Chancellor announcing in his statement that the Big Lottery Fund would be protected. We’re determined to keep the pressure up to make sure this cannot happen again.